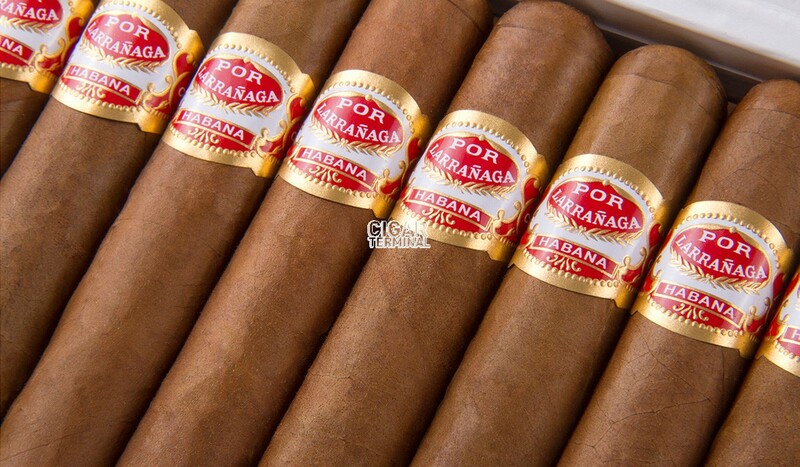 The Por Larranaga Picadores is a sweet Coronas Extra that will age beautifully, of 48 ring gauge, 5" (127mm) long and comes in a box of 25 cigars. 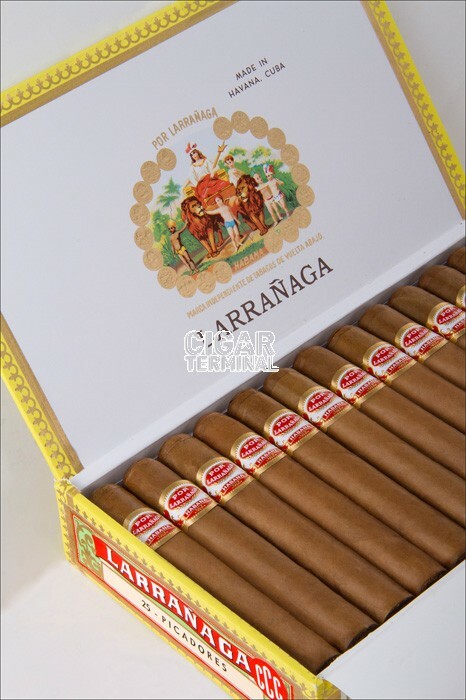 The Por Larranaga Picadores is a newly released (2014) and exclusive cigar, only 8400 boxes have been produced and only available in La Casa Del Habano shops. • It was a popular vitola until it was discontinued in the seventies. • Great potential for aging. 5 years on, the Picadores will offer some rich caramel-like sweetness and some spicy tobacco. A great choice of cigar to age for any aficionado. Grab a box of this beautiful cigar before it’s too late! The cigar is looking very good, and it feels good in hand as well. The Picadores is sporting a redesigned band, with a modern style and bright white, red and gold colors. It is actually inspired from the old design of the Picadores band in use until the seventies. This band is now used on all Por Larranaga cigars since 2014. The construction of the cigar is excellent, it is well packed and firm when squeezed between the fingers, with no soft or hard spots. The triple-cap is very pretty, flat and with almost invisible seams. The wrapper itself is beautiful as well, of dark-brown color and with a slight oily sheen on the surface/. Once the Picadores has been lit, the first draw give some rich flavors of tobacco, some spiciness too (cloves again and nutmeg). On the finish, some woody/herbal notes. Big billows of smoke are released at each draw. The burn is good and doesn’t require attention. In the first third, the Picadores offers some smooth and mellow flavors. There are is some subtle sweetness, of burnt sugar, almost caramel-like, reminiscent of the typical Por Larranaga sweetness. There is also just a slight note of bitterness from herbal tones, which are signs of the cigar’s young age. The body of the cigar is just under a medium level. 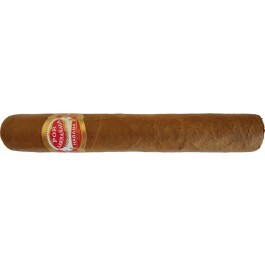 It is better to smoke this cigar slowly in order to enjoy its smooth flavors. The ahs falls off while entering the second third. The ash has a nice light grey color. In the middle third, the flavor profile evolves a little bit, with the herbal flavors a bit more dominant, with some powerful and creamy black tea notes. There are also some deep flavors of leather, but without any trace of ammonia until here. The strength of the cigar is now at a medium body. In the final third, the flavors of coffee, of smoked cedar wood also join the mix. The caramel notes recede in the background, leaving more room for the leather and the coffee in the foreground. In the final draws, there is just a bit of green taste, nothing to worry about though, since it is a fresh cigar. In summary, the Picadores is a nice sweet and mellow young smoke. It should reach its full potential within the next 4 to 6 years. So grab a box while you still can. This cigar has crawled to the top of my list for when I want a serious smoke,the mild smooth first third slides into a serious mid cigar with leather,herbs and a woody flavor that I adore,the last third gives you the acidic bite to remind you that this boy is going out with a punch, this is my favorite Sunday afternoon smoke. This cigar has become my favorite after smoking just three sticks. Starts off smooth with lingering flavor that is pleasant and grows with an earthly intensity for first 2/3.smokes down 1/2 way before giving up ash! last 1/3 with full flavor and never gets harsh.great after work cigar with my after work beverage! Saw the Picadores and read the specification. Large ring size in a shorter length - a super sized petit corona. This is a great in between when you have the time for a real smoke, and want something more than a petit or a mille fleur. Great flavor, more intense than the petit corona. Getting more. Let these sit in my humidor for a couple months before lighting one up. Wonderful Cuban flavor immediately. Evolving flavors throughout without ever becoming harsh. arrived in about a week, all cigars oily, no cracks, great flavor, thanks!